Please read the disclaimer listed below before entering our site. The AVWA is in no way affiliated with or sponsored by VWaG or VWoA. The VW logo and the marks VW, Volkswagen, Beetle and Bug are registered trademarks of VWaG. The use of Volkswagen names and their model names, descriptions and/or numbers are used in applications and descriptions for reference purposes only. Their use in no way denotes or infers a direct connection between the AVWA and any vehicle manufacturer or their authorized agencies. Use of various companies names and product lines within this website exists only for descriptive and informational purposes and does not infer any direct connection between the AVWA and these companies. 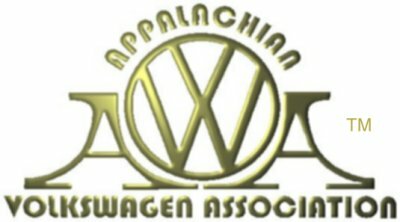 AVWA, the AVWA logo, Appalachian Volkswagen Association, Hippie Days, Circle Yer Wagens, Gatlinburg VW Expo, Pigeon Forge Bug In and Alabama Bug Jam are TM of the Appalachian Volkswagen Association. Unless otherwise noted, content, layout and graphics of this site copyright 2018-2019 AVWA. We no longer send event notifications via the US Postal Service. CLICK HERE to find how to receive info on our upcoming shows & events.